With toasted almonds for crunch and a sprinkle of sea salt on top, these Salted Almond Chocolate Truffles are a chocolate lover’s dream! They’re easy to make, Paleo-friendly, and vegan. A batch of these truffles makes the perfect holiday gift. This post is sponsored by Diamond of California. Sometimes, the best compliment you can get on a dessert is silence…just the sound people chewing, and maybe the occasional moan of satisfaction as it’s devoured. When I brought out these salted almond chocolate truffles at the end of my grandpa’s birthday dinner and passed them around the table to my family, I got silence (rare) and a lot of “mmmmm”s. Then the Tupperware went around the table again…and again. That, my friends, is the ultimate compliment. And isn’t that why we all cook, and bake, and make truffles? To make people happy? I know that’s what’s always driven me – to put a smile on people’s faces through good food, made with love. That’s what I strive to do with every post I publish for you, and I hope it comes through. Luckily, you can make lots of truffles anytime you want because these little babies are EASY, and you only need four ingredients – maybe five or six, depending on the coating option/s you choose. And because there’s so few ingredients, quality is important here. First up – the chocolate! Use the good stuff here (like the best you can afford), because it’s the base of our truffles and if you use sub-par chocolate, you will have subpar truffles. I used a 70% dark chocolate, but you can go lighter or darker depending on preference. Make sure your chocolate is dairy-free to keep these Paleo + vegan! 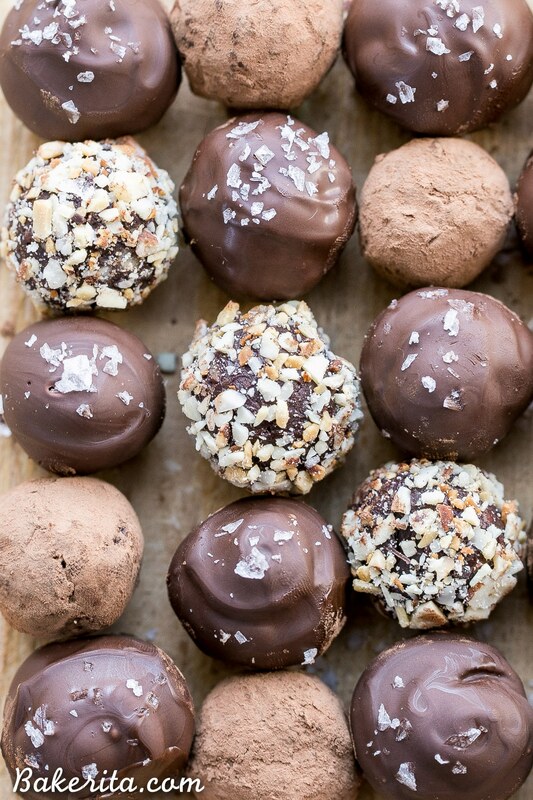 Canned coconut milk is used as a cream replacement to make ganache for these truffles. I used full-fat and recommend you do the same for the richest, creamiest truffles, but lite will do in a pinch. Our third ingredients is toasted almonds, chopped up super fine to add bits of crunch. I used almonds from Diamond of California because I know any nuts I get from Diamond are going to be high quality and tasty. Toasting the almonds is key for the best flavor, so don’t skip that step. Flaky sea salt is the last ingredient you’ve gotta have. Regular salt just doesn’t do the trick here. By using the bigger flakes of sea salt like Maldon, you get the crunchy texture and bursts of salty flavor, which is the perfect complement to the dark chocolate. It’s also essential for sprinkling on top of the truffles! 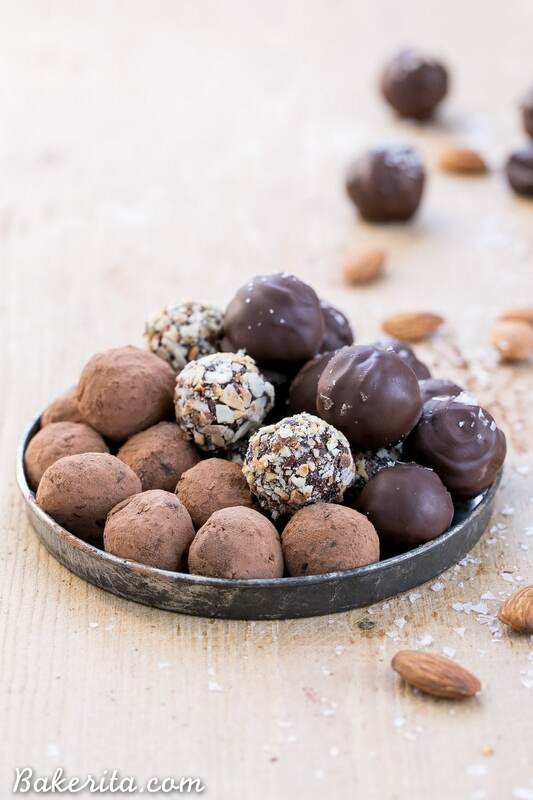 The truffles are made by making a ganache with the chocolate and coconut cream, and then stirring in the toasted and chopped Diamond Almonds and adding flaky sea salt to taste. That mixture then has to get nice and firm in the fridge before you can form little truffle balls and get dipping + rolling! I wanted variety, so I rolled some of my salted almond chocolate truffles in cocoa powder, some in chopped + toasted Diamond Almonds, and some were dipped in melted chocolate and sprinkled with sea salt. Variety is the spice of life, right?! Psst – I used the swirled dipping tool in this dipping tool set and it made life so much easier when dipping these. 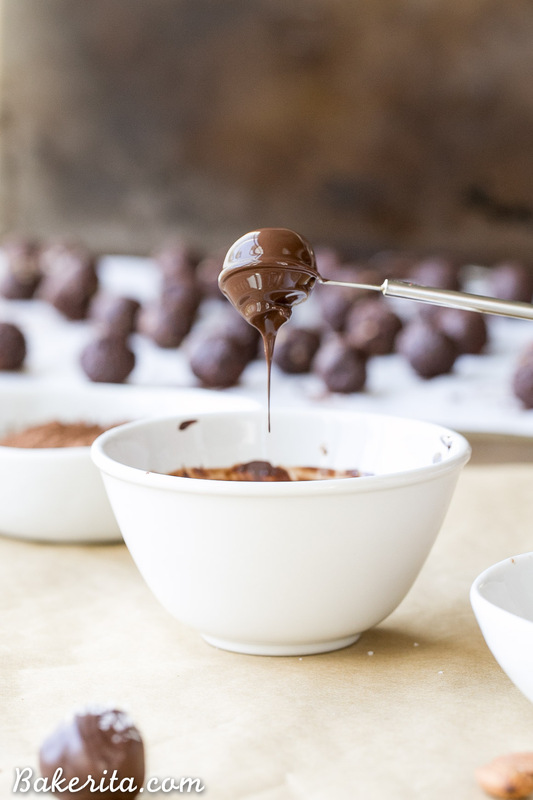 These salted almond chocolate truffles need to be kept in the fridge and they’ll last a couple weeks…but I doubt they’ll last that long to begin with! These are perfect for holiday gifting, and you can always double the batch to make extras – no one can turn down a box of chocolate during the holidays, right? 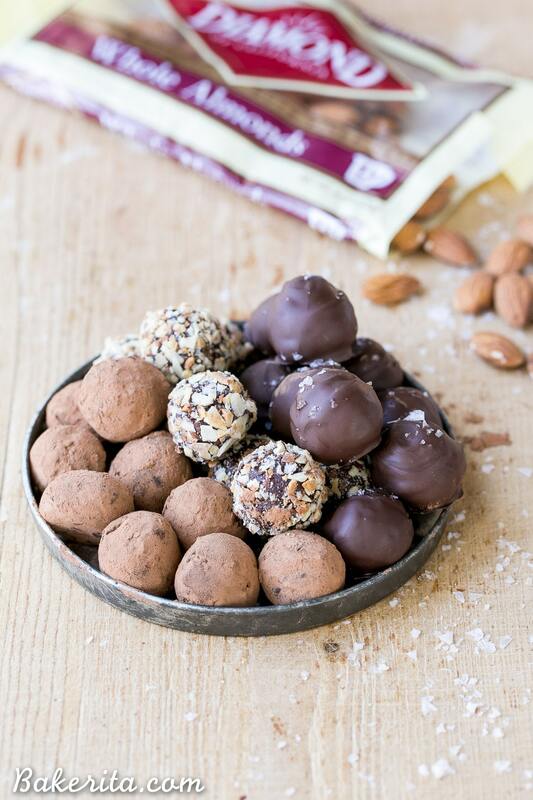 Time for you to be devouring one of these easy Salted Almond Chocolate Truffles – so creamy it’ll melt in your mouth, with the nutty crunch of toasted almonds! 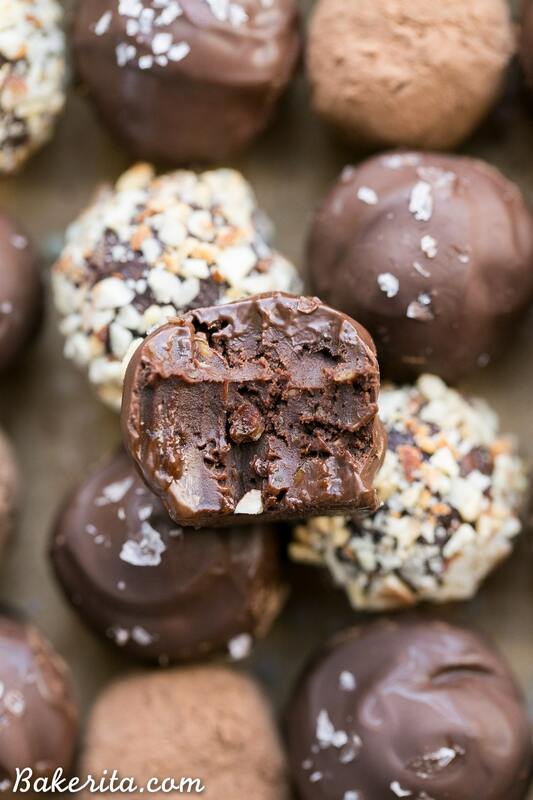 These vegan + paleo truffles are irresistible. I hope your day is full of chocolate! Enjoy. Place the finely chopped dark chocolate in a medium sized glass bowl. Heat the coconut milk in the microwave for about 1 minute, until it’s just beginning to bubble. Pour the coconut milk over the chocolate, making sure all the chocolate is covered. Let stand for 2 minutes, and then whisk until smooth. If some chunks of chocolate remain, microwave for 15 seconds and whisk again until smooth. Stir in the chopped almonds and sea salt. Taste, and add more sea salt is desired. Cover with plastic wrap and refrigerate until firm, about 2 hours. If the mixture gets too firm to scoop, let it soften at room temperature. Line a baking sheet with parchment paper and use a small scoop or melon baller to form small, 1” truffle balls. Place on the baking sheet and repeat until all of the chocolate is used. For the coatings: if you want a cocoa powder coating, roll the truffles in cocoa powder and shake lightly in a sieve to remove excess cocoa powder. For the nut coating, roll the truffles in the finely chopped almonds. For the chocolate coating, melt the dark chocolate and coconut oil in the microwave in 20-second increments, stirring between each, until completely smooth. Use a fork or dipping tool to dip each truffle in chocolate, letting the excess drip off before placing on the parchment. Sprinkle with flaky sea salt and let set completely in the refrigerator. Keep truffles stored in the refrigerator. Seriously, the best feeling in the world is the sincere smiles of joy that come after someone takes a bite of your homemade treat! I’d be smiling too if I took a bite of these truffles! Love the sweetness of the chocolate with the saltiness of the almonds, YUM! Isn’t it?! Thank you so much, Bethany! I agree, silence can be the best compliment when it comes to food! It sounds like these truffles were such a hit, and I can see why! They look SO good Rachel! What a perfect dessert or sweet treat! These truffles are TOTAL Monday food that I need!! I love the three different ways you decorated them too! So fun to look at. I need to make myself a batch of these beauties ASAP! Right?! Everyone needs some chocolate on a Monday morning ;) thanks so much, Sarah! There’s nothing better than making something for family and friends and having them enjoy it and silence speaks louder than words for sure!! These look SO good and absolutely perfect for gifting during the holidays….I better make sure I make extra to save for me and hubby, though ;) Pinned!! Happy Monday! Definitely must make extra to keep for yourself! Thank you so much, Dawn. I am just SO ready for all the holiday bites and candies! These look ridiculously amazing Rachel! Hi Esta, I use Trader Joe’s canned coconut milk, which doesn’t have any additives. Silence really is a great compliment, huh?? So true!! And these truffles … I have a feeling I’d be silent eating these!! These look so fantastic and simple! And I’m all for spending a little extra cash on GOOD chocolate. It’s always worth it. And yes on the flaky sea salt. That’s all I ever want to use in whatever I’m cookin. NEED these truffles! You never cease to amaze me with your paleo-izing! Truffles are one of biggest weaknesses, especially rolled in crunchy nuts! I love them all, but would especially devour the ones rolled in almonds — yum! They’re one of my favorites too! Thanks so much Marcie! I know my best friend would love a huge tray of these Salted Chocolate Almond Truffles and so would I. One item off my holiday check list is marked off! That is such a compliment Rachel! And I can see why. These look deliciously decadent. And yes, they would make awesome gifts for friends at holiday time! Thanks for sharing! those mmms and, even better, silence, is definitely the sign of success. so true – the best part is seeing a smile on the face of anyone who’s enjoying what you’ve made with love! i can’t wait to make these – they look amazing!! i know i’ll make these this holiday season (probably a few times) and with a variety of nuts; i know my husband will go crazy over these with pistachios :D thank you!!! They sound fabulous with pistachios! I love you love them Emily. Thanks for your kind words! Hi made these tonight how long can you keep them in the refrigerator for? Can you freeze them? Hi Sam, they should be good in the fridge for a couple weeks. I’ve never tried freezing them but if you put them in an airtight container they should be good for about 3 months.